Introduction: The importance of a thorough preoperative anesthesia machine check cannot be over-emphasized. The modern breathing system has evolved such that automation makes the checkout process easier, but does not eliminate the possibility of leaks at unusual sites. We present a case wherein the source of circuit leak was hidden, and highlight the importance of troubleshooting with simple, reliable alternative airway management when the anesthesia machine/circle system does not perform as expected. Case Presentation: Following intravenous induction for elective breast surgery, it was impossible to ventilate patient. An audible hissing sound was heard with attempted mask ventilation, despite what appeared to be excellent seal. The sound was clearly not emanating from around the face mask, though pinpointing the specific location was difficult due to background noise in the operating room (i.e. conversation, sound of suction device, monitoring tone). The circuit was carefully examined with no obvious leak detected. Patient’s oxygen saturation declined from 100% to the mid-90’s (Fig A). A prompt switchover was made to bag-mask ventilation via portable circuit and IV propofol was titrated to maintain anesthesia. Upon enlisting the assistance of other OR personnel in a quieted room, the source of leak was found to be the CO2-canister, which was cracked (Fig B). Replacement of the canister immediately corrected the problem and no further leak was observed. Patient was intubated and had uneventful surgery. Discussion: Ventilation issues from desiccant canister leaks are not uncommon, as the canister itself is a key component of the ubiquitous circle system (Fig C). Review of anesthesia circuit leaks by Tokumine et al revealed 32% of leaks were due to violations of canister integrity. Several case reports have mentioned multiple makes and models of anesthesia machines with similar leaks. Reported leaks do not appear to arise from manufacturers’ defects, but from mechanical trauma to canisters, or from incorrect installation. 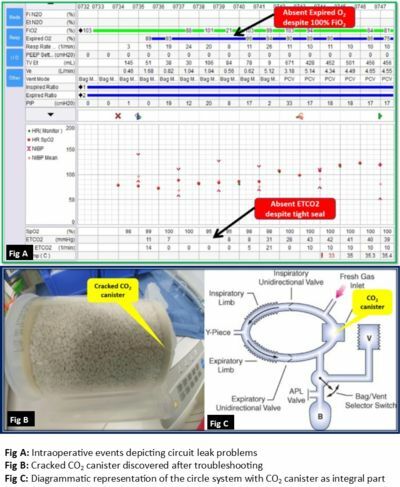 The majority of canister leaks are discovered during pre-anesthesia machine checks, though in our case the leak was not discovered until after induction. The importance of initiating basic airway management in the event of anesthesia machine failure or malfunction is a concept that every anesthesia provider should understand. Failure to initiate appropriate temporizing actions can result in hypoventilation, hypoxia, hypercapnia, and potentially anoxic brain injury. Initial management of a circuit leak should therefore focus on maintaining ventilation and oxygenation as first priority. Timely execution of logical, sequential steps in adjusting machine settings and troubleshooting the circuit is also imperative. When faced with unreliable delivery of inhaled anesthetic agent, maintenance of anesthesia is easily achieved with intravenous anesthetic agents. Anesthesia providers must possess a low threshold for bypassing potentially malfunctioning equipment and switching to a “fail-safe” alternative ventilation system such as the self-inflating bag, and must call for help early on. This provides the ability for one individual to ventilate the patient independently, without distraction(s), while other responders can calmly methodically troubleshoot the anesthesia machine and circuit.